The Universal Church of Truth is an intolerant religious movement that sends its zealot soldiers throughout the galaxy to force others into its belief system. Their armies crisscross the universe in giant Temple Ships that are powered by the faith of their followers. Those that do not believe in accordance with church are labeled heretics and executed or rehabilitated. They are also fond of rehabilitation where they use drugs to break the wills of their foes and brain wash them into following the movement. The Church has spread through much of the universe and is very powerful. They are constant foes of the Guardians of the Galaxy. Who is Adam Warlock? Is he Starlord's father? Location - They are spread throughout the galaxy however their planet origin and their home base is Sirius X. The second homeworld of the Church is called Sacrosanct. I do not know which Star System it is in but it is likely still within the Milkyway galaxy. The enforcers of the church doctrine are called Black Knights. Black Knights are warriors of a variety of alien races, they sometimes have super powers, they some times do not, they are always religious zealots ready to fight to death. The elite forces of the church are called Cardinals they are super powered warriors. Magus - The alter ego of Adam Warlock is the founder and defacto leader of the movement. Matriarch - The leader of the movement in Magus's absence. The Universal Church of Truth is created by the evil alter ego of Adam Warlock called the Magus. Adam Warlock is sucked into a different dimension where he is twisted and made evil. He then is sent 5000 years in the past to the Planet Siruis X. He is attacked by locals who he easily kills. The survivors begin to worship him as a god. Using his advanced knowledge Siruis's technology begins to far exceed of anyone else at the time. The church quickly begins expanding like a virus across the Universe. The church is one of the main vehicles of power for Magus. 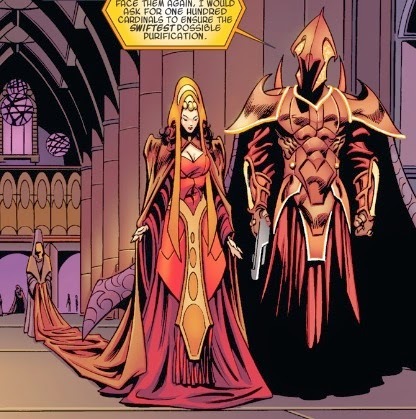 With the church Magus is able to conquer the entire universe in some timelines. The time traveler Kang has warned that nearly all timelines are becoming Magus timelines leading the Guardians of the Galaxy to try to attempt to kill Magus, or Adam Warlock before he becomes evil. Even when they think Magus is killed, the church and it enigmatic leader seem to continue to live on. The Church was not featured in the Marvel movie Guardians of the Galaxy. Warlock's cocoon was featured in the Collector's warehouse and at the end of the movie his cocoon appears to be broken open. This would indicate that Adam Warlock is some where in the universe. This could mean that there is also a Magus, and a Universal Church of Truth. It would make sense to have the Church as a villain if Guardians of the Galaxy 2 is focused on Adam Warlock.